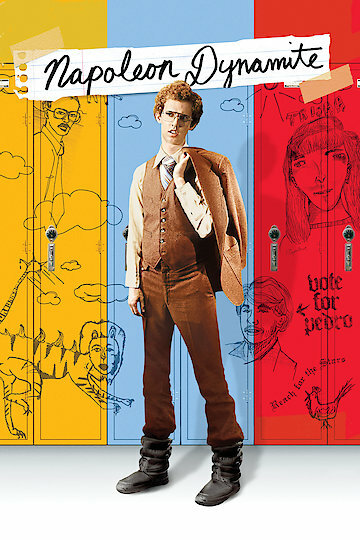 “Napoleon Dynamite” is a highly popular cult comedy that was co-written and directed by Jared and Jersusha Hess. The film’s star is Jon Heder who portrays the title character. The movie is set in Idaho and follows the day to day mundane life of Napoleon Dynamite. Napoleon is treated as a bit of an outcast and he spends his school days day dreaming, doodling fantasy animals and spinning tall tales about wolverine hunting in Alaska. Napoleon has a very nontraditional home life. He lives with his grandma who spends her days three wheeling in the dessert. Also at home is Napoleon’s older brother, Kip. He spends his time chatting on the internet looking for love. After Napoleon’s grandmother injures herself in a biking accident, she calls in uncle Rico. Rico lives in his van and dreams about his high school glory days of 1982 when he was on the football team. In his free time he researches various get rich schemes. Napoleon is not happy to have Rico around and doesn’t want Rico telling him what to do. Things aren’t too bad for Napoleon. He makes some friends at school. Deb shows up at the door selling homemade trinkets and glamour shots photos. She leaves her suitcase of wares on his desk and he tracks her down at school to return them to her striking up a friendship. He also meets his new best friend, Pedro Sanchez, when he shows Pedro around the school after he has transferred from Mexico. Pedro is soft spoken but not afraid to go for his dreams. He enlists Napoleon’s and Deb’s help to run for class president. His opponent in the race is the ultra-popular Summer Wheatley. Pedro’s campaign speech in not impressive, but Napoleon saves the day by performing a dance number to support Pedro’s candidacy. The film was so popular that it was spun off to an animated television series. Napoleon Dynamite is currently available to watch and stream, buy on demand at Amazon, Vudu, Google Play, iTunes, YouTube VOD online. As if "Family Guy," "The Simpsons," "American Dad," "Bob's Burgers" and "The Cleveland Show" weren't enough, Fox has two new animated shows lined up for the coming TV season. "Napoleon Dynamite" and "Allen Gregory" aim to add to Fox's already-strong lineup of animated shows with an even more impressive lineup of voice talent.